With the food insecurity rate for the 27 counties of Western North Carolina estimated at 16.3 percent in 2012 and almost a third of the region’s census tracts classified as food deserts in 2010, it is estimated that 220,000 residents have need of food assistance. The Supplemental Nutrition Assistance Program, or SNAP—formerly known as the Food Stamp Program—is the largest program in the nation’s hunger food safety net and offers food-purchasing and nutrition assistance to millions of eligible, low-income individuals and families. SNAP is administered through the Food and Nutrition Service of the U.S. Department of Agriculture (USDA). SNAP benefits are distributed in North Carolina through the Department of Health and Human Services, Division of Social Services. The Special Supplemental Nutrition Program for Women, Children, and Infants, known as WIC, is a separate program administered by the USDA Food and Nutrition Service, providing federal grants to states for supplemental food, health care referrals, and nutrition education to low-income pregnant and postpartum women and to infants and children up to age five who are found to be at nutritional risk. In North Carolina, WIC benefits are distributed through the Department of Health and Human Services, Division of Public Health. Just over 14 percent of the households in Western North Carolina received SNAP benefits in 2013, about the same as the statewide percentage. 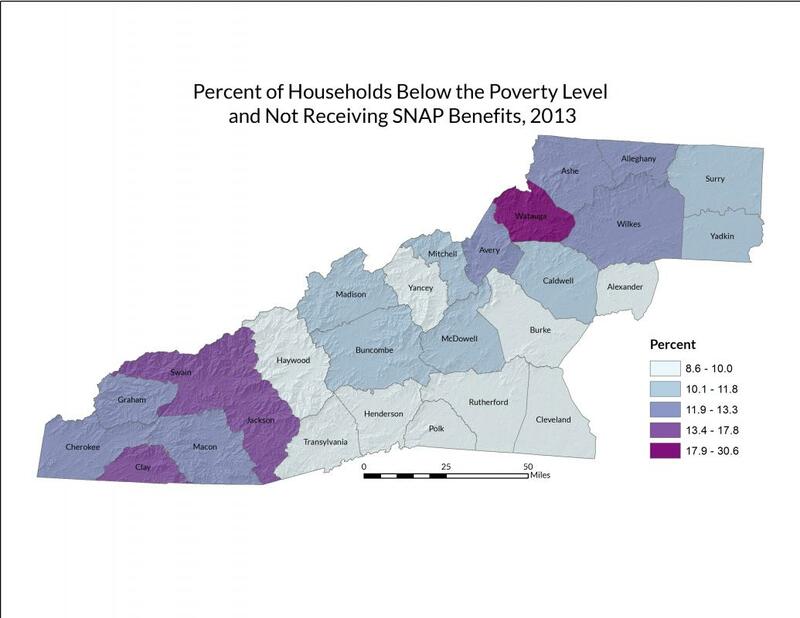 Regionally, the counties with the highest number of households receiving SNAP benefits were Rutherford (21.6 percent), Wilkes (18.6 percent), and Avery (17.1 percent), while the counties with the lowest number of recipients were Watauga (8.6 percent), Henderson (9.6 percent), and Jackson (9.9 percent). A gap may exist in some counties between the number of individuals who may be eligible for food assistance through these programs and the number of individuals who are receiving such assistance. Eligibility to receive SNAP and WIC benefits varies based on individual circumstances—including available resources, income level, employment status, and other factors—but for identifying potential gaps at the county level, poverty rates can serve as a general guide. For example, households that fall below the poverty line but are not receiving SNAP benefits can help identify a potential gap in SNAP program coverage. 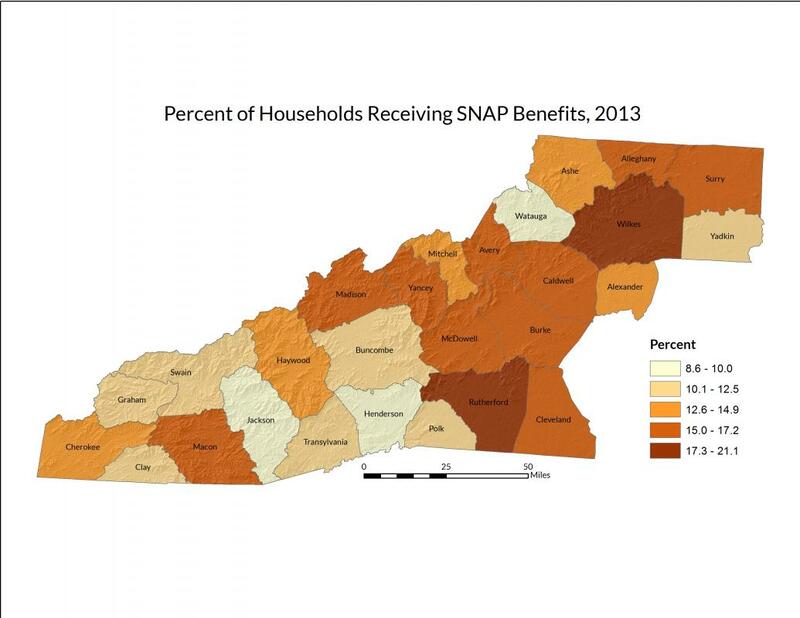 Using this measurement, Watauga County had the highest gap in SNAP coverage in the region, with 30.6 percent. With a 32.8 percent household poverty rate in 2013, it is important to note the demographic difference between Watauga and other counties in the region due to its large student population, who are less likely to earn incomes above the poverty level. Jackson County, too, has a large student population that may also not accurately reflect poverty level statistics. Swain County had the second highest gap in coverage, using this measurement. With 11.5 percent of households receiving SNAP benefits and 23.4 percent of households falling below the poverty line (the second-highest in the region), it is estimated that—in 2013—the SNAP program was not used by nearly 18 percent of households that would otherwise have been eligible. Compare this to the 9.7 percent of eligible households in the state, and 8.8 percent in the nation, that did not benefit from the program. The WIC program determines eligibility using many factors. In 2011, it was reported that statewide WIC assistance covered 55.8 percent of eligible women, infants, and children in North Carolina, compared to 62.7 percent nationally. This is consistent throughout the rest of the Southeastern region, which has the lowest WIC coverage rates when compared to other regions. The Western region recorded the highest coverage rates nationally, at 74 percent. This also means, however, that 44.2 percent of eligible women, infants, and children in North Carolina did not receive assistance through the WIC program. The National School Lunch Program and the School Breakfast Program are a federally assisted meal programs providing nutritionally balanced, low-cost or free meals to children each school day. School districts and independent schools that choose to take part in the programs get cash subsidies and food from the USDA for each meal they serve. In return, they must serve breakfasts and lunches that meet federal requirements, and they must offer free or reduced-price meals to eligible children. The USDA’s Food and Nutrition Service administers the program at the federal level. In North Carolina, the Department of Public Instruction administers school meal programs through its School Nutrition Services Section. Several programs are available to North Carolina public, charter, and non-public schools and residential child care institutions, including the School Lunch Program, School Breakfast Program, the After School Snack Program, the Special Milk program, the Fresh Fruit and Vegetable Program, and the Seamless Summer Option. Eligibility for participation in free or reduced-price meal programs is based on a variety of factors, including household income. For the 2012–2013 school year, children living in four-person households may have been eligible for free or reduced-price meals if the household income $42,643 or below. In the 27 counties of Western North Carolina during 2012–2013 school year, 61 percent of admitted students were determined to be eligible for free or reduced lunch programs. Percentages ranged from a high of 73.18 percent of admitted students in Cherokee County, 72.15 percent in Rutherford County, and 71.70 percent in McDowell County to a low of 41.35 percent in Watauga County, 46.95 percent in the Asheville City Schools District (the only school district in the region that is not county-wide), and 53.72 percent in Alexander County. North Carolina Department of Health and Human Services, Division of Public Health, Women and Children’s Health Section, Nutrition Services Branch. WIC Program. Accessed March 2015 from: http://www.nutritionnc.com/wic/. North Carolina Department of Health and Human Services, Division of Social Services. Food and Nutrition Services. Accessed March 2015 from: http://www.ncdhhs.gov/dss/foodstamp/index.htm. North Carolina Department of Instruction, Child Nutrition. School Nutrition Services. Accessed March 2015 from: http://childnutrition.ncpublicschools.gov/. U.S. Department of Agriculture, Food and Nutrition Service. National School Lunch Program (NSLP). Accessed March 2015 from: http://www.fns.usda.gov/nslp/national-school-lunch-program-nslp. U.S. Department of Agriculture, Food and Nutrition Service. National and State-Level Estimates of Special Supplemental Nutrition Program for Women, Infants, and Children (WIC) Eligibles and Program Reach, Volume 1. Accessed June 2015 from: http://www.fns.usda.gov/sites/default/files/WICEligibles2011Volume1.pdf. U.S. Department of Agriculture, Food and Nutrition Service. School Breakfast Program (SBP). Accessed March 2015 from: http://www.fns.usda.gov/sbp/school-breakfast-program-sbp. U.S. Department of Agriculture, Food and Nutrition Service. Supplemental Nutrition Assistance Program (SNAP). Accessed March 2015 from: http://www.fns.usda.gov/snap/supplemental-nutrition-assistance-program-snap. U.S. Department of Agriculture, Food and Nutrition Service. Women, Infants, and Children (WIC). Accessed March 2015 from: http://www.fns.usda.gov/wic/women-infants-and-children-wic.